COLLEEN TOLEDANO IS A STUDIO ARTIST FROM BUFFALO, NY AND HOLDS A MFA IN CERAMICS FROM OHIO UNIVERSITY. COLLEEN´S COMPLEX AND THOUGHT-PROVOKING WORK IS POWERFULLY INFLUENCED BY THE RECOGNITION OF OUR SOCIETY'S YEARNING FOR BUILDING REVITALIZATION AND BODY IMPROVEMENTS. CREATING IONIC OBJECTS OF BUILDING CONSTRUCTION THROUGH THE MANIPULATION AND TRANSFORMATION OF CLAY SHE SPEAKS ABOUT THE IMPORTANCE OF SELF IMPROVEMENTS AS A MEANS TO ONE'S OWN PERSONAL CONTROL AND POWER. 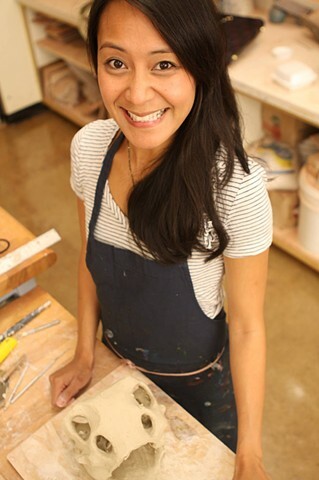 CURRENTLY SHE IS AN ASSISTANT PROFESSOR OF CERAMICS AT BUFFALO STATE COLLEGE IN BUFFALO, NY.